Learn the 3 factors and 4 elements of restaurant concept design. A restaurant business plan must include a clear description of the restaurant concept. You can’t do this unless you are acquainted with the 3 factors that influence restaurant concept design. This guide provides an easy to use metric for weighing your options and determine the best type of restaurant for you to open. Learn how to tell a good location from a bad one. Know who to serve and make sure you’re choosing the right service. Use the 4 elements of restaurant concept design to plan your position in the market and evaluate the competition. The term “restaurant concept” is often used to refer to a restaurant’s service type. You may have heard other terms used to describe a restaurant such as “Fast Casual” or “Full Service.” But a restaurant concept is truly much, much more than just service type. It’s the whole plan for your unique restaurant - and why it’s a great idea. The restaurant concept is what most of your business plan is based on. It’s your location, your brand, your unique selling proposition; it’s the design of your interior and how your kitchen is run. A restaurant concept is a system for doing things and why they’re done that way. What are the components of a restaurant concept? These three conditions act together to introduce a unique set of demands that make a restaurant concept suitable or unsuitable. They are interconnected, so movement in one area changes the dynamic. For example; different capital and a different location would change who your target customer is. Picking your target customer first puts a demand on your location, and so on. Available Capital - Capital determines the of the scope of your restaurant concept. Without a clear idea of how much capital you have access to, there is no sense of focus for the project. Access to startup capital determines the budget and provides context for our initial decisions. Startup capital is the base number around which other numbers revolve. It’s how we compare opportunities. By estimating how much startup capital is required, you can determine if a location, service type, target customer, etc. 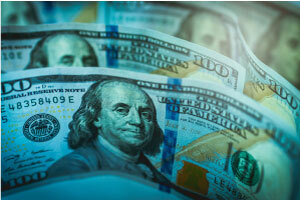 are the right opportunity for your finances. How much you can contribute personally? What kind of loans do you have access to? The goal is to get the most “bang” for your buck. How you spend your startup cash is an important part of your restaurant concept. 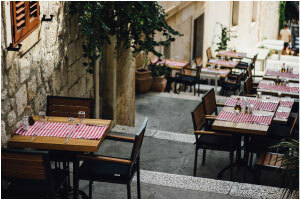 Available capital is a primary determiner of the location and size of your restaurant. The size of your restaurant determines the type of service you can offer and the location establishes who your target guest should be. Restaurant Location - The location (and size) of the restaurant contribute a lot regarding the concept. The specific site you choose for your restaurant will have a direct impact on your business plan. Renting, leasing or buying property should Ideally be no more than 5% of sales. Kitchen size effects how much food you can make, how much storage room you have and how many people can safely use the kitchen at one time. 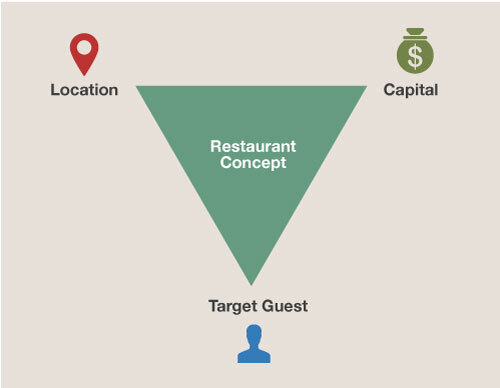 Location - The location of your restaurant largely determines who your target customer is. Most of your guests will come from the area within 10 miles your restaurant. Either choose your location based on a target you have researched already or choose a location you can afford and narrow in on a target that makes sense based on the location. Target Guest - Discovered through performing an investigation, called market research. Their preferences are a function of their lifestyle and needs. The first step to determining the target guest is to understand the community and people who live around the restaurant. 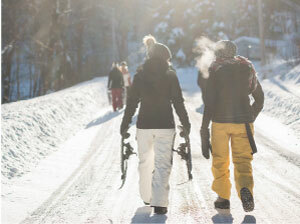 Perform demographic research and spend a significant amount of time in the area. 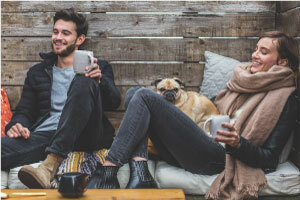 Learn about their lifestyle and interests to see if it’s a true fit. Most cities also have population and demographic information available on their websites. Smaller communities may have this information available through the chamber of commerce. Decide who to target - You can use the information you find about age, gender, income, race, and population to create a predictive model of the lifestyle choices and needs of the different people in your community. Does it make sense to target a small group that doesn’t spend much money eating out? Do you have enough startup capital to capture the fine dining crowd? Create systems to serve your target’s needs - Once you have identified your target and you have defined their needs and preferences, the next phase is to spend time developing process and systems designed to deliver appealing service to your target customer. Spend as much time as you can getting to know their life story. Use what you discover about their interests to create themes when designing your restaurant. 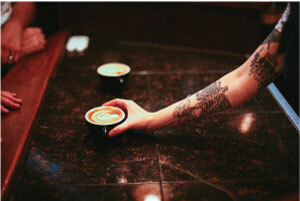 Everything from the lighting to the menu to how staff greets guests should attract your target. Develop training and procedures for staff that ensures consistent delivery of the guest experience you’ve designed. Fine Dining - Table service, set courses and mealtimes, formal dress and conduct required. Fine dining offers luxurious decor, high quality and specialty food along with superior service. Guests expect to be pampered and given a unique experience. In exchange, guests expect to spend much more money. Challenges for the owner are attracting sophisticated customers and working against the notion that it’s a place to go, only for special occasions. Casual Dining - Offering table service and high-quality food with more flexible mealtimes. Expectations for dress and conduct has a wide range depending on the particular establishment. Popular with office workers and professionals, these establishments often have a large bar and run various discount promotions. Challenges are balancing food cost and quality, competition and finding the right target market to appeal to. By decreasing the focus on alcohol, a casual dining restaurant can be a Family Restaurant. Introducing a kid’s menu or kids eat free promotion. Buffet - Casual dining without table service. Food is set out in trays and customers have the choice of many different items. May choose not serve alcohol to appeal to families. Reduced staffing needs lower labor cost. The appeal to large groups means you’ll need sufficient space in the dining room to accommodate. Other challenges are food waste and lowbrow reputation. Guest expect that quality is sacrificed for cost and it may be hard to challenge that perception. Fast Casual - Counter service, no table service. Food is prepped on site and quality is expected to be better. But guests are still looking for a lower cost menu. Fast service is a key selling point, and this style of restaurant is popular near office buildings and campuses where people take lunch breaks. Challenges are competition and balancing food cost with value and speed of preparation. One way to differentiate and appeal to your target market's tastes is to offer a unique cuisine. For example combining fast casual with an ethnic, fusion or vegetarian menu. Fast Food - Drive-through, counter service, no table service, A limited menu and little to no on-site prep. Foods are usually pre-made. Advantages are limited labor costs; frozen foods can be bought in bulk and quickly prepared. Challenges are the perception of low-quality food, tight profit margins and serious competition from major chains that spend a lot of money on advertising. 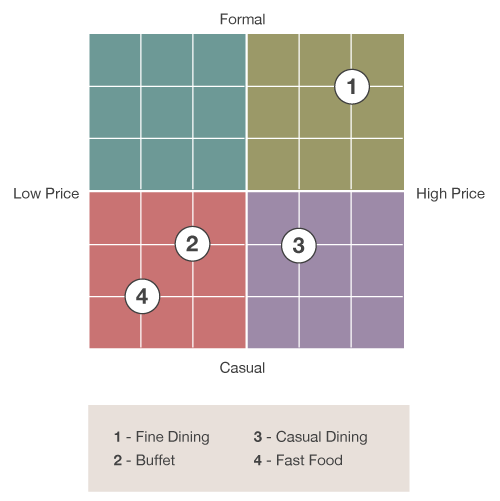 Another way to classify a restaurant is on a 4-way graph. Top to bottom is price, left to right is how formal the restaurant is. When doing market research ask your target market where on the chart they like to dine the most. Then ask them where on the chart your restaurant concept is. Ask them additional questions to find out how to bring the two points closer. Use the 4 elements chart to evaluate restaurants nearby. This will help you determine who your competition is. Learn from their mistakes and successes. Try something different to break away from the pack. Restaurant concept design is a complicated process, but understanding the 3 factors that determine what kind of restaurant makes good business sense for you to open is an important start. Using the 4 elements of every restaurant concept helps you place yourself uniquely in the market, with the ability to adapt to the needs of your target guest.